NEW YORK: The March of Dimes Foundation has hired MSLGroup North America as lead creative, strategic, and PR agency for its "imbornto" cause marketing campaign, which will run from Mother's Day to Father's Day of next year. NEW YORK: The March of Dimes Foundation has hired MSLGroup North America as lead creative, strategic, and PR agency for its “imbornto” cause marketing campaign, which will run from Mother's Day to Father's Day of next year. MSL's work for the campaign, now in its second year, will include out-of-home, digital, PSAs, PR, and social media. The Publicis Groupe agency will also lead strategy for a corporate partnership initiative that will focus on fundraising. Renee Wilson, president of North America at MSLGroup, said in a statement that the win represents where the firm is headed. “It builds on our experience in integrated marketing, cause, and partnership marketing, as well as our deep knowledge of communicating with moms,” she said. MSL will spotlight the health research and funding the March of Dimes brings to maternal and infant health issues. “Our challenge moving forward is three-fold: driving interest in the campaign, creating engaging and interesting creative assets that will excite and entice corporate and brand partnerships, and enhancing creative components around this so that it breaks through the clutter in the marketplace,” said Scott Beaudoin, SVP of the New York consumer marketing practice and global director of PurPle (Purpose + People) at MSL. Ultimately, the firm wants awareness of the imbornto campaign to reach the same level as St. Jude's “Thanks and Giving” effort and the American Heart Association's “Go Red for Women” initiative,” Beaudoin added. 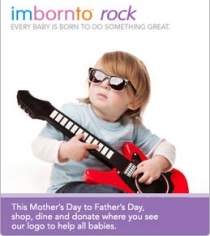 March of Dimes unveiled the imbornto campaign in April. The group said at the time that its goal is to increase awareness of the foundation's mission and to raise money for its research and programs. Through the campaign, March of Dimes partnered with media, retailers, sports and entertainment organizations, and brands to bill itself as the “Official Partner of Mother's Day and Father's Day.” The effort involved a call-to-action encouraging consumers to shop, dine, and donate where they see the March of Dimes logo during the period between Mother's Day and Father's Day. In the effort's first year, the organization worked with HSN, eco-friendly product-maker The Honest Company, ProFlowers, Destination Maternity, Kmart, and Famous Footwear, as well as investment bank Media Venture Partners, which promoted the effort. A representative from Media Venture Partners did not return a request for comment. Media Venture Partners will continue to help the nonprofit reach out to potential corporate partners, said Douglas Staples, SVP of strategic marketing and commutations at March of Dimes. The organization has also worked with AAM Brand Marketing. MSL can provide “some new thinking” the organization felt imbornto needed. The firm won the account after a competitive pitch process in part because March of Dimes felt it went above and beyond. In January, March of Dimes hired House of Success to launch a strategic PR and brand campaign for the “Healthy Babies are Worth the Wait” program and to educate African-American women about the risks of pre-term births.